Sutton [1, 1959] states, "Lithuanian seaport and district on the Baltic, formerly a part of Germany. Under Allied control after WW1, and occupied by French forces until February 1923. 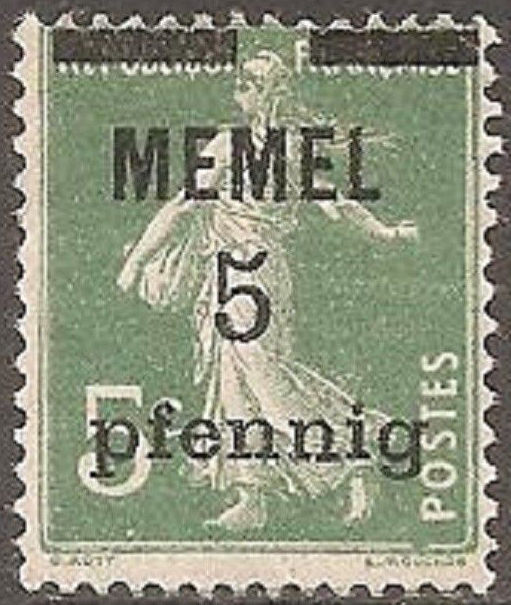 Both France and Germany overprinted stamps during this French occupation. 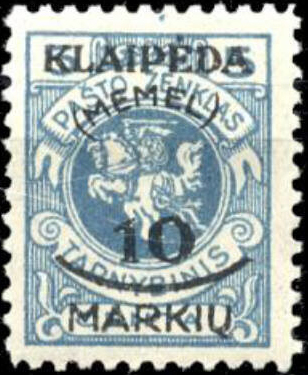 In 1923 it became part of Lithuania, was renamed Klaipéda, and was issued with overprinted provisionals. It was restored to Germany in 1939 and is now under Russian dominance". Wikipedia brings the story up to date as Lithuania gained independence on the breakup of the Soviet Union. 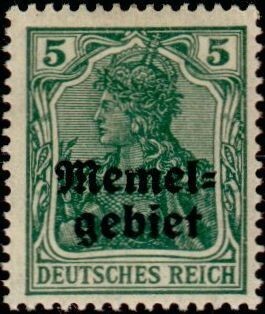 Although France was in control, Gibbons  lists Memel under Germany (Part 7) and begins with surcharged French stamps, Scott begins with overprints of German stamps. On the Lithuanian occupation issues, Scott distinguishes between Memel printings (various colours, N1-N6) and Kaunas printings (all black N7-N11). Sources: RJS , ScS, SGP7.